operates Pam Roberts Wedding & Floral Design. 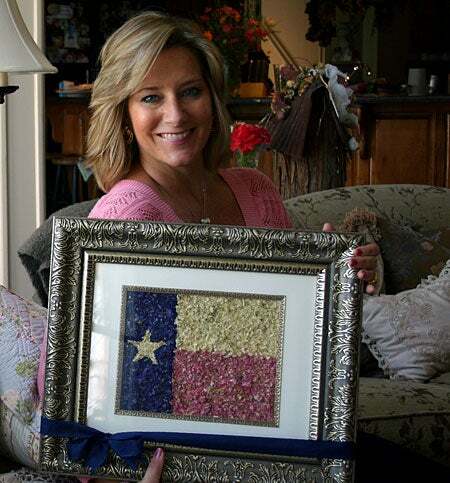 Pam Roberts, AKA Alexa-Jayne with the Texas State Flag created in flower petals. This one was specially made for President and Mrs. George Bush. 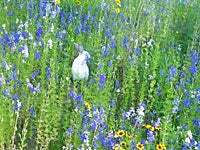 Pam Roberts, one of our members down in Pensacola, FL, not only grows a beautiful flower meadow, but uses the flowers’ petals in a unique way. She dries the blooms, and then creates exquisite framed pictures of the colorful petals to form beautiful monograms, flags, and other images. She also grows wildflowers to use with her "other business," Pam Roberts Event and Floral Design." She does weddings, anniversaries, etc. and fills them all with wildflower events. We’ve heard from Pam several times, and she has built a business with her creative efforts. You can visit her website called Alexa-Jayne.Blogspot.com and see more examples of her flower petal art. Pam's garden is always a riot of color. 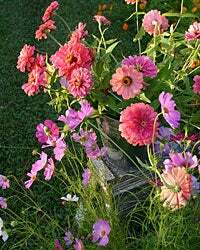 Here her zinnias light up the scene. 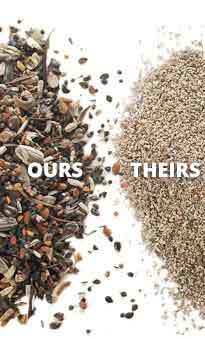 She uses our seeds to plant the gardens, and then harvests the blooms when the petals are bright and fresh. For making monograms, her main species is , Delphinium ajacis. This is the one that is so good for drying — the delphinium you often see in dried flower bunches with dried blooms in shades of pink, red, blue and white. For events, all the flowers are used. For example, were the stars of a "picking party" she held for a bride and her bridesmaids. 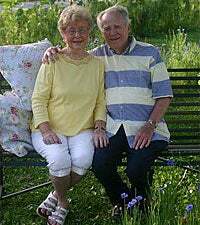 And the couple on the bench are Pam's parents, celebrating their 50th Anniversary — dressed up to match the sunflowers and blue bachelor's buttons. Pam writes, “As an avid gardener and artist, I guess you could say I think in flowers!” Starting with the monograms, Pam’s business, Alexa-Jayne, has grown to include wreaths, dried arrangements, note cards, tea towels—even entire custom-created designs and ideas for “wildflower weddings” and other events. Pam and the beautiful things from Alexa-Jayne have been featured in various newspapers and magazines from local articles to a major feature in Southern Living, one of the best home/garden magazines in the country. We’re delighted Pam sent us these photos to share with all our members. Visit her website to see more of her beautiful creations.